Over the seven years of the Mastercard Foundation Scholars Program at the University of Edinburgh, we will be welcoming 80 Undergraduate and 60 Postgraduate Scholars to Edinburgh through full academic scholarships. In addition to studying on degrees across the University, the Scholars will be participating in a leadership program which will challenge them to reflect upon their journey to Edinburgh, their ambitions for themselves and their communities, and how they can make a positive impact on their return home. As Program Manager of the Scholars Program and now in our second year, we have used the start of the Scholars Program to understand the experience of the students to design and test how we can best hold the space for their learning journey and support them in their development as authentic transformative leaders. It’s been slow and hard work to develop the Scholars Program at Edinburgh into an ecosystem that complements Scholars’ full time studies and helps them further develop and reflect upon the attitudes, skills, and knowledge of a transformative leader. While it has taken time, it’s proven to be a useful case study into incorporating a more collaborative student-centred approach to building educational learning spaces in higher education institutions. 1. Design Day | Vision Backcasting. Using Kaospilot’s Vision Backcasting Tool – we facilitated a Design Day for our Scholars to build the Scholars Program starting from a shared vision. You can read about this process here. This process is centred around the vision and the actual skills, knowledge and attitudes Scholars wanted to gain from the learning space. From here, the different groups of Scholars mapped out the stages they wanted to cultivate these skills, knowledge, and attitudes through the Scholars Program and what content activities would do this. 2. Synthesis. We took the different iterations of the vision backcasting framework to create a master list of skills, knowledge, and attitudes and the development of these over the course of the Scholars Program. While different groups of Scholars completed the vision backcasting tool, it was amazing to see the overlaps in the thinking about how the approaches to learning journey were quite similar. From here we created three phases of the Scholars Program – understanding, practicing, and embodying transformative leadership. We talk a bit more about these different phases later on. 3. Program Blueprint. Using this master list of skills, knowledge, and attitudes, we created a blueprint of how these will be delivered year upon year. While student numbers increase dramatically each year, Scholars will be participating in different phases of the Scholars Program while the capacity of the team will remain the same. Developing the blueprint and the final Scholars Program package allowed us to think about the service we create around the program and where resources need to be used more effectively. 4. Testing prototoypes. On top of designing the Scholars Program, we also spent a great deal of Year 1 testing different ways of facilitating the ecosystem. From small groups, large groups, individual sessions, long thin solutions, short and fat opportunities – we tested numerous realisations of the the Scholars Program. This allowed us to understand how our activities could meet the needs of our Scholars and test the capacity within the team. One of the most useful places to experiment was the Edinburgh Summer School which focused on transformative leadership. As a four-week immersive school, we used it as a place to play with different models of co-design, reflection, mindfulness, and ways to work with partners on applied learning frameworks. You can read more about the Summer School here and the design here. As mentioned above, this work allowed us to shape the Scholars Program into three phases of transformative leadership journey based on a shared vision. 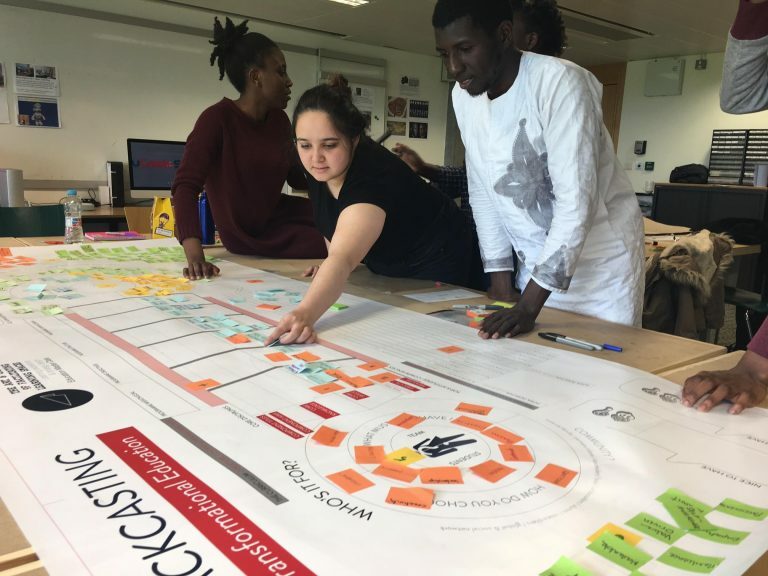 Scholars’ vision for the programme| With this programme at the University of Edinburgh, young people courageously change narratives, transform lives, and make a positive impact locally and globally. Understanding Transformative Leadership | In addition to introducing the concept of transformative leadership, the first phase of the transformative leadership journey on the Scholars Program will focus on understanding strengths, reflecting on Scholars’ journeys, identifying ambitions for moving forward, and gaining practice in working effectively within diverse teams. This includes the Edinburgh Summer School, Reflective Coaching Sessions, and the discussion groups on gender, identity and leadership. Practicing Transformative Leadership | This phase of the Scholars Program will build off of the Scholars’ understanding of transformative leadership, the self and teams. It will focus on further exploring and practicing transformative leadership in different settings and contexts both in the UK and in their home regions. This stage includes work-based and project-based placements and their support packages, the Africa-based summer school, giving back opportunities, and action-led learning opportunities which run throughout the year. Embodying Transformative Leadership | As the last phase of the Scholars Program, this will bring together all the work from the previous year/s and focused on facilitating pathways into enterprise, consultancy, employment, further education, and any other opportunities. Scholars will focus on packaging up their transformative leadership journey and learnings in order transition effectively into life beyond the scholarship and Edinburgh. You can see the full breakdown of skills, attitudes, and knowledge in each phase in our slide deck here – Scholars Program 2.0. Despite the hard work up to now, we will continue to value the process. We are seeing every year as an opportunity to further test and iterate on the Scholars Program package. This past month, I was lucky enough to share the stage with some amazing speakers (including the First Minister Nicola Sturgeon) to share our reflections on supporting young people as part of the launch of the Fire Starter Festival. The Festival is a wonderful space to celebrate and ignite creativity and innovation in the public service and the launch was definitely in this spirit. 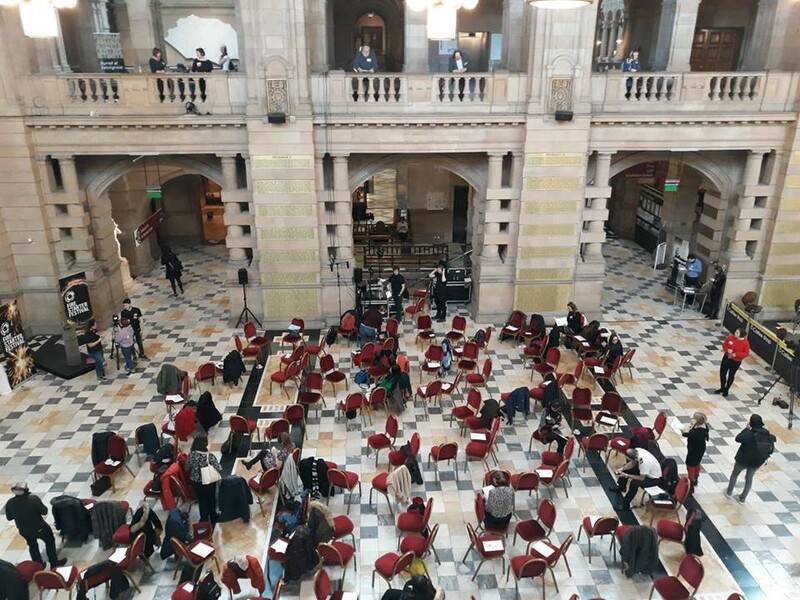 In the Kelvingrove Museum in Glasgow, the morning took a silent disco approach — speakers were perched in spots throughout the museum and their reflections were being streamed straight into participants’ headphones as they explored the space. It was definitely a new way to present but it felt comfortable, authentic and rooted in the message. This talk came at a powerful time for me as we are waist deep into Year 2 of the Scholars Program, in the midst of recruiting our third group of students, and I am preparing for maternity leave and my first baby — I am feeling deeply reflective on my work, my childhood, and my future. There have been numerous threads throughout these reflections — one being a note of wisdom from my mom. I wanted to share my talk here. When I was a teenager, I dreamed of being a professional volleyball player. I spent hours in the gym, took any chance I could to play, and put my heart and soul into my dream. During the regular season with my local team, my coach stopped playing me with no real explanation. Despite weeks of trying my best, I came home from training one night heartbroken and discouraged. On telling my mom about it, she looked me square in the eye and said ‘so what are you going to do about it?’. From there, she helped me map out a plan to talk to my coach and think about things I could do in my training program to get better. The next day, my teenage self (terrified and shaking) approached my male adult coach to tell him how much I wanted to contribute to the team and asked him what I needed to do to play. Years later I would go on to be an All-American volleyball player, captain to a top-ranked volleyball team, and a three-time Final Four player. On reflection, that moment with my mom changed everything. She didn’t tell me what to do or offer to do anything for me. She didn’t brush me off, patronise me or make me feel silly for my feelings. She gave me something that I had all along without realising it — she gave me agency, she gave me power, she gave me control of a narrative that I didn’t know was mine. By challenging me — she supported me and stoked a fire in my belly I didn’t realise was there. That fire would invite an eclectic & entrepreneurial adventure that would take me all over the world. To the country Georgia working in refugee camps and collective centres. To a legal aid clinic in downtown Kingston. To being an viral internet sensation where we not only launched a product to get women cycling in skirts but brought awareness to the experience of women on the roads. To connecting with 50 cities worldwide through CycleHack — a global movement giving everyday citizens a chance to improve their journeys. To Edinburgh where I spent years exploring new ways of working with young people in a learning environment. Which led me to my current role with the Mastercard Foundation Scholars Program at Edinburgh University. Now this is a dream job. I get to spend everyday working with young people from Africa who are firestarters to the core. The Mastercard Foundation believes that education is the way for young people to change their destiny and make a difference in their communities. Through their Scholars Program, Edinburgh University has received funding to provides scholarships to Africans with great potential but few educational opportunities. Over 7 years, we will welcome 200 students to Edinburgh to study on full scholarships on academic programs across the University. Currently in our second year, we have had 33 Scholars on the Program and 6 graduates with a majority of the Scholars being women. Central to the scholarship is the idea of transformative leadership — how your values, beliefs, and principles enable you to make a positive impact on your community. On top of their studies, we run a leadership program that helps Scholars understand, practice and embody transformative leadership. It includes a holistic support structure, reflective touchpoints, and experiential learning opportunities such as placements in the UK and the continent and summer schools with community partners in and in Kampala. The more I reflect on our role, we are the scaffolding for their leadership journey — they are the architects that build and navigate their learnings and experiences to prepare them for the transitions they will face for the rest of their lives. Their journeys to Edinburgh have been full of dedication, triumph, heartbreak, resilience, and fire-starting passion. A man wanting to change the way his country addresses female genital mutilation while raising two young girls of his own. A woman who uses the spoken word to empower young women to see the value in themselves in her community. A woman who slept on the streets with her heart set on getting an education so she can help make a change in her country. Education and enterprise to them is answering the question ‘so what are you going to do about it?’. It’s finding where their skills match the needs of their communities and countries. And my mom’s question has woven its way through the design, delivery and content of the Scholars Program at Edinburgh. Through each step of the journey — we strive to give them agency to understand themselves, shift their narratives, stand up and practice leadership, and create a road map for going forward based on their values. And it’s important right now — our young people in Harare, Zimbabwe to Aberdeen, Scotland are preparing for a complicated world which requires resilience, creativity, systems thinking, and a whole lot of confidence in managing uncertainty with little resources. It needs authentic transformative leaders who know when to stand up, when to lead, when to follow, when to wait and when to walk alongside. The lessons of my journey and the Scholars Program don’t necessarily give me answers today but instead — provocations. As educators, civil servants, designers, parents, mentors, role models, neighbors, active citizens and firestarters — what are we going to do about it? How might learning journeys prepare young people for all the transitions they will experience throughout their lives? Oftentimes the greatest lessons we learn are not in the classroom, but are experienced by rolling up our sleeves and taking our learning out into the wild. Be it the volleyball court, in internships, through volunteering, or getting a chance to actually work with a community on a problem — deep transformative learning happens in real life where we can play, practice, fail, and collaborate without hierarchy. This idea of wild learning builds experiences that young people can draw from for the rest of their lives as they navigate their careers, opportunities and challenges. This isn’t just about young people getting jobs — but being active, engaged, and compassionate citizens of their communities. How might we create ecosystems which nurture confidence? We talk a lot about authenticity and vulnerability on the Scholars Program. One Scholar told me she had enjoyed being on a program that valued her whole self, not just her as a student. She said it helped her feel brave and bold. To create a community of leaders, they need to be able to understand who they are and where they are going — they have to be confident in their authenticity and vulnerability. I would argue that this requires a great deal of reflection and spaces where we can give feedback to one another. How might we design learning journeys that include these components to help our young people feel brave, bold and confident? And lastly, how do we be our own product? How do we lead by example? We talk a lot about this within the team — if we are cultivating a space of transformative leaders, how are we ourselves practicing that? How are we taking risks, collaborating, failing and getting up and trying again. How are you modeling this behavior to show young people that change is possible, we don’t have to operate within the box. The reason my mom’s question was so powerful to me is because time and time again — I saw how she answered that question. I saw what she did about it. Through her job, through decisions she made in her life, through her role as a mother, partner, friend, and neighbour. I saw her fight for social justice and be an advocate to those who were vulnerable and couldn’t stand up for themselves. I saw how her faith led her to take compassionate action. As the Scholars Program grows, as today is a launch of countless firestarting events all over Scotland — I look forward seeing how our Scholars and how this room & those across the country respond to the question — so what are you going to do about it? We talk about how to start - how to make an idea big, beautiful, and important. How to ideate and prototype and iterate. We talk about business model canvas, cash flows, and communication plans. We talk about gaining confidence and now failure - how to do it, embrace it, and run with the lessons. We talk about new, more, and growth. I never once thought about the exit strategy - about letting go. Thinking it was negative, I never thought about how I would walk away from an idea. How do you have that conversation with yourself that your heart isn't in it any more and that by sticking around - you are no longer breathing life into your work? If anything, you are taking it away. No one really talks about this bit amidst their inspiring ideation sessions. I said goodbye to TEDxPortobello and CycleHack at the end of last year. Anyone that knows me knows that these two wonderful spaces were built into my professional and personal narrative. They gave me countless special moments and people and led me to where I am today. The decision to move on lived in my belly for months and I refused to acknowledge it was there for a long time. I refused to think that I might be a 'quitter' or that by not having enough on my plate meant I wasn't working hard enough. This was a big thing - to me, if I wasn't 'busy' it reflected badly on me. It made me think about letting go and how much we don't talk about it. As a kid, we talked a lot about the graceful exit as a way to manage transitions and values. I've tried to be true to this mindset in a lot of my life but it wasn't until the past year that I felt the true meaning of the graceful exit in terms of my work. Not other people's work - but my own 'roll up your sleeves and create something new and great' work. From this both painful and exhilarating process - I learned a lot about myself and how we need to talk about walking away. We need to talk about how letting go is okay. Just because you are leaving doesn't mean it wasn't great. Just because you are leaving doesn't mean that your contributions and takeaways are any less important. I will always have the wonderful memories of CycleHack and TEDx. Making the Kickstarter film for our very green idea to the masterclasses where speakers shared their talks in progress - these moments will always be true. My involvement in their growth will be true as well. This was a hard one for me. I was raised in a family with superhuman work ethic and trained as resilient athlete - I don't quit things. I finally came to understand this isn't about joining or quitting - this about transitions. Your business, project, or idea is ready to grow in a new way and it doesn't include you (which is hard at first, but I promise it gets easier). For CycleHack - Matt and Sarah have used the opportunity to grow the business is a more meaningful way. For TEDx - the new team is dynamic and creative. Their ideas are flat out better than mine and that will make the community stronger. Maybe your project will stop. This isn't failure - this is a transition that means something great (which you might not know about yet) will come of it. Sometimes the project will go on, sometimes it won't - but it's a transition for the better nonetheless. There is a great deal of peace in gratitude. As letting go of something brings up all kinds of feelings - a fear of regret, guilt, uncertainty - navigating these emotions becomes an art in itself. You just gotta go through these bits. But the grace of a goodbye is finding the gratitude for all that is happened (good, bad and the ugly) and carrying that with you like precious cargo. Approach a new venture with intention. When you start something new - take time to think about what's important to you (not just your business), what you value, what gives you energy. Share this with your team. Think about this often and check in - make sure you are being true to yourself. No one likes to think about an ending at a beginning but it's a crucial part of any start. This isn't negative or pessimistic - it's being true to your idea and will make it big and strong if it needs to be. Your work is only as strong as your heart. I guess this doesn't always have to be the case - you can do your work without heart. You can do your work without your full attention and care. This isn't how I want to commit my time. If you are tired and lacking the love - your work will suffer greatly. Cultivate the passion and energy for your business outside of to-do lists and if you approach your work with intention, it's easier to feel the shift and transition. A friend of mine gave me some great advice one day and I think about it often. Think about your idea, business, and work as a partner - as a pal, boyfriend or girlfriend. If your work /idea/business was a person - would you want to meet it for a beer? Does it give you a sense of worth and challenge you to be a better version of yourself? Does it inspire you and give you energy? If you explained to your best friend how it made you feel - what would you say? If for the most part it doesn't do these things often (and let's be real - it won't always will all the time) - ask yourself the tough questions. Be honest with your partners and colleagues but more than anything - be honest with yourself. Every exit is truly an entry. I ran my first marathon this year. I’m far from a runner but have been inspired by my new found running legs. They have given me time to myself, a space to breath and feel my strength, and approach some pretty difficult transitions head on. More than anything, my running legs have allowed me to be an explorer and create my own adventures. And 2016 has been all about exploring and leaning into opportunities, challenges, and adventures. It’s been a wild road of new and old, but it’s taught me a lot about myself, what work means to me, and friendship. I’ve had to make some tough decisions over the past few months which has meant letting go of projects that are important to me. After over three years, I decided to step away from CycleHack. From the inception of the idea to building the brand through the past three events - CycleHack has weaved its way through my life. With gratitude, excitement and sadness - the time is right to walk away. After two TEDxPortobello events, I decided to step away as curator and pass the baton onto a new inspiring crew of leadership. TEDxPortobello has taught me a great deal about imagination and what we are capable of together. I’m forever grateful to the people I have met along the way. Despite saying goodbye, I’m so proud of the work this year. It’s been creative, challenging, and allowed me to work alongside some inspiring people. In January I launched my consultancy Go Jo to bring together my creative facilitation, project design, and event management activity. I had no idea where this would take me and I'm so excited to look back. Some of my favourite work was with Dani at Tribe Porty, Lorna and Bill at TEDxAbertay University, and the National Library of Scotland on redesigning the Library of 2025 and create a Library Lab. Cyclehack saw another fantastic year with 25 cities participating in the global event over the same weekend in June. Loads of fantastic hacks were developed over the weekend. Check out some of the highlights of the weekend here. TEDxPortobello 2016 was a total success! With another sell out crowd, fantastic speakers, and hundreds of people watching the online stream - I'm so proud of the team and the community for helping this special space grow. Read more of my reflections here. After a year of hard work and lots of redesigning, we launched the new Innovative Learning Week and later went on to win the Educational Event of the Year in Scotland. Thanks to amazing Snook, we were able to create a new festival of creative learning that spoke to the needs of our student/staff community and allowed us to experiment, play, and make together in a more meaningful and effective way. It was a pleasure to be able to share some of my experiences from speaking at the Creative Edinburgh's Creative Corporate Love event to the Scottish Institute of Enterprise dinner with young entrepreneurs. They are such valuable opportunities to reflect on the work and engage with a new community of people. In June, I started a new position at Edinburgh University managing the brand new MasterCard Foundation Scholars Programme. For the past six months, we’ve built a team, a programme, and recruited 12 of the most amazing Scholars you’ll ever meet. It's been an absolute dream job and I’ve learned so much. I can’t wait to see where we go. Read more about the programme here. By far, my favourite part of any project is the people and there are have been some fantastic ones. Thank you to Dani, Bob and Alan for being you - constant inspirations, awesome people, and teaching me all I know about friendship and love. To Chris, Steve, Keith, and Geoffrey - I’m constantly inspired by your skills, talents, and willingness to roll up your sleeves. Thank you for your kindness and compassion. Esther, Simon, Gerry, Leah, Mel, Sophie, Arran, and Eugenia - it’s been such a pleasure to work with you and be a witness to your shine. Silje - thank you for all your hard work and putting your whole heart into what you do. To James, Roy, Barbara, Christina, Steve, and Derek - working with you is both meaningful and the most fun I’ve ever had. Thank you for having faith, putting in the work, and caring so much - and for the coffee. Thank you to Lorna for being my first Go Jo gig! Sarah, you amaze me and I’m so happy to not only work with you - but share beers and good chats often. Jen and Sarah, you are wonderful strong women and our friendship inspires me beyond words - even if it's just over What's App these days. My dearest Mark, Haley, Elise, Roberta, Tilly, Mom and Dad - I’m grateful everyday for having you in my corner. Innovative Learning Week - the University's Festival of Creative Learning won the Education Event of the Year at The Drum Scottish Event Awards. Read more here.